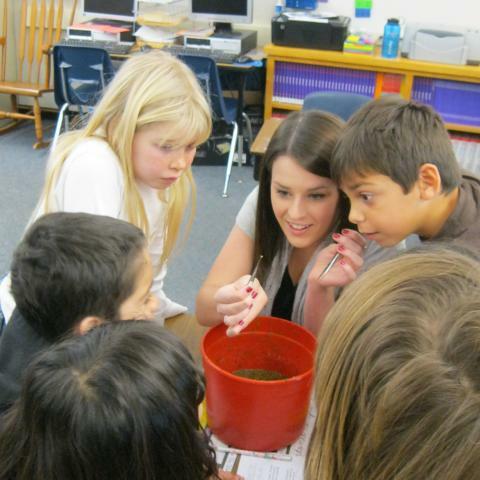 Duckweed experiment excites third grade students and Jan term college students give instruction inspiring young minds. 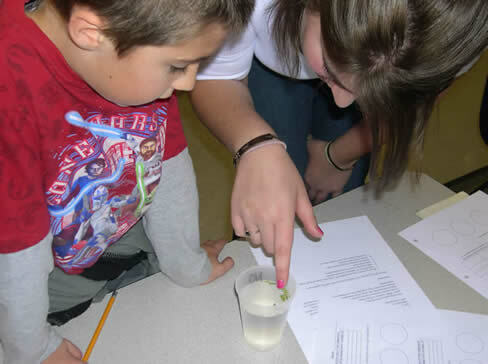 Third grade students consider one duckweed plant ready for the experiment with the able assistance of a Saint Mary's College student (Photo by CILSA staff; Jan 2011). The three precious Water and Watersheds courses were designed with an educational outreach component. After performing some simple experiments in our laboratories and visiting a few field sites, the classes were given the task to design a safe experiment to be provided to elementary school children. The college students were informed about the California State Science standards and since inquiry is an important component, students decided to have the third graders perform an experiment similar to the bioassay done by their class during the first week of the college course. The college students took the initial bioassay lab handout and planned revisions to make it more straightforward for the third grade students. A list of needed items was compiled by the class and the instructor worked to assembled the requested materials. The experiment was planned to occur over two days (one for setup and one for final analysis). Since there were at least 3 and as many as 6 third grade classrooms to receive the experiment simultaneously the college students were empowered to work in teams to make a brief presentation, distribute materials, and assist the 3rd graders in setting up the experiment. The educational outreach experiment used duckweed which a free floating plant as the test organism. The selected elementary school was a short distance from campus and the opportunity to have an experiment provided was well received each year. The third grade classes at this school visit the Mtn. View Sanitation District (www.mvsd.org ) Wetlands in Martinez where the duckweed was collected for these experiments. The January visit by the Saint Mary's College gives the elementary school children a brief foreshadowing of the place that they will visit later in the year. Additional resources on wetlands such as word puzzles were found at US EPA websites and this information can be made available to the local elementary schools, too. Buckets containing duckweed were also brought to each classroom so the third grade students saw it before traveling on their own field trips to the site where it was collected. (photo by CILSA staff).